63. I've got a date with Frank! #63. I've got a date with Frank! 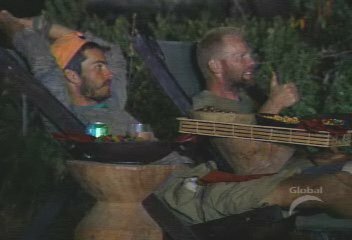 This is one of those "it could only happen on Survivor" moments, and is yet another example of an unexpectedly touching scene that we rarely see on Survivor anymore. Because, like Paschal and Sean at the Marquesas barbecue, this scene involved two people from vastly different lifestyles and backgrounds that were thrust together for purposes of a reward trip. Well, perhaps I shouldn't say "thrust" together because Frank will probably hunt down and murder me. So... um... er... let's just move on. Needless to say there was definitely no thrusting involved at any point. 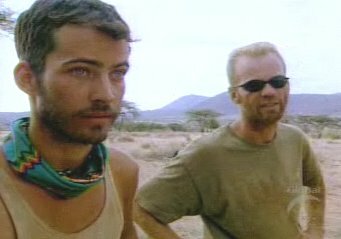 I am talking, of course, about the famous movie date between Frank and Brandon in the ninth episode of Survivor: Africa. 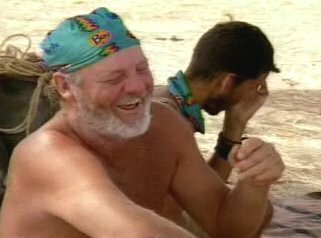 It was the most unexpected and awkward reward pairing the show has ever seen, even more so than "The old man and the brother" in Marquesas. And why was it so awkward? Well because Frank and Brandon hated each other, of course! You could not have found two more dissimilar people to pair together and send off to see a movie. In fact not only were they dissimilar in just about every manner possible, they actively and vocally said that they disliked one another. Repeatedly. 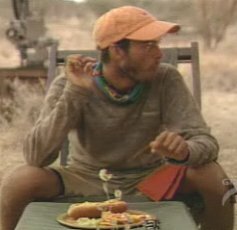 Thus their "dinner date" in the African desert easily became one of the most awkwardly funny scenes in Survivor history. 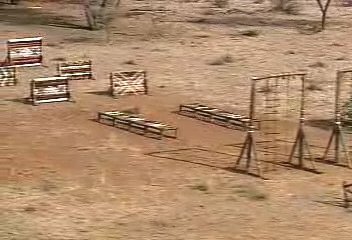 It was the ninth episode of Survivor: Africa, and that meant there were eight players remaining in the game. And anytime you have eight players in the game, it becomes a magical moment because it usually means a random reward pairing. It happened in Africa, it happened in Marquesas, and both random pairings ended up being comedy dynamite. Because otherwise there was no way Frank and Brandon would have ever even ended up in the same room with one another, let alone on the reward trip of a lifetime with one another. That's how powerful the enmity was between the two of them. Why did Frank and Brandon dislike one another so much? Well it's simple for the most part. Frank Garrison was a 40 year old ex-military guy who wasn't particularly warm, friendly, or open minded. He was very set in his ways, he didn't have very much tolerance for anybody, and in the words of Tom Buchanan, "Frank has the personality of an 80 year old." Oh yeah, and Frank didn't like gay people. But you probably could have predicted that. Brandon, of course, was a young gay man who was very flamboyant, very outspoken, and not the least bit tolerant of ex-military men who didn't like gay people. So it's safe to say that he and Frank weren't going to get along very well. And in fact, they didn't. 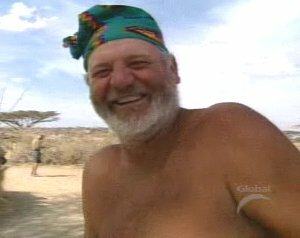 Frank and Brandon had been thrown together on the same tribe at the start of the game (much to the delight of the casting department), and they were mortal enemies by the end of the first episode. Just like the producers probably intended. So that's the back story behind Frank and Brandon. They didn't like one another. They wouldn't speak to one another. Hell, they wouldn't even consider aligning with one another. They would both rather lose the game than align with somebody they didn't respect, and that's exactly what happened in the end. Both of them lost the game due to their own prejudice. But that came later in the game, and is really neither here nor there in terms of this countdown. 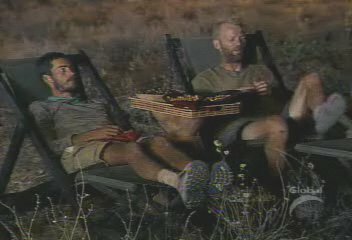 No, our moment at #63 is when Brandon and Frank were forced to be partners in the ninth reward challenge. The Moto Maji tribe received tree mail at the start of the ninth episode, and the players were told they had to break down into teams of two. The fairest way to do this seemed to be random drawing, so that's what they ended up doing. Ethan ended up paired with Mama Kim, Lex wound up with Teresa, Little Kim ended up with Big Tom... and then of course we had our dream pairing. Frank and Brandon. And the rest of the players could not have found this matchup any more amusing. 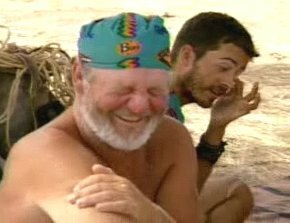 The other players knew how much Frank and Brandon hated one another, and Tom in particular couldn't stop giggling over it. 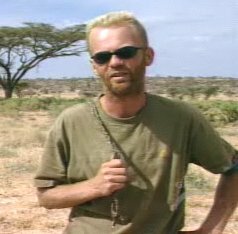 Tom even tells us in a confessional that if he ever wanted to get revenge on Frank, he couldn't have picked a meaner thing to do to him. This doesn't mean that Tom wants to switch partners, of course. He's more than happy to see how Brandon and Frank will end up working as a team. In fact (like most of us), he's very much looking forward to it. So the challenge starts and immediately we get our comedic money's worth. Because not only do Frank and Brandon win the challenge, Brandon actually turns into a taskmaster! He screams and yells at Frank the entire time, badgering the older military man to "HURRRRRY!!!!" or "GET MOOOOVING!!!!" 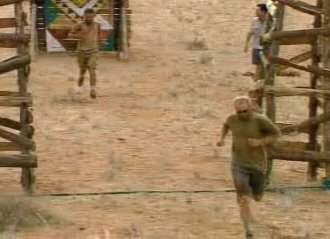 And the other players are standing there laughing their asses off, watching little Brandon bully Frank all the way through the obstacle course. It's really a pretty funny scene all around. Brandon yelling at Frank to GET MOVING!!!! The funniest part of the challenge comes at the end, when they win. And Brandon enthusiastically screams out, "I've got a date with Frank! I'VE GOT A DATE WITH FRANK!!!!" "I've got a date with Frank!" So anyway, Frank and Brandon win the challenge. And what is this fantastic "date" reward that now awaits them? Why, they will be enjoying a movie together! Brandon and Frank are going to be whisked away to the African Savannah, where they will enjoy a cozy (and romantic) private screening of "Out of Africa." They will get food, candy, drinks, and two big comfortable recliners so they can relax and enjoy the movie in peace. 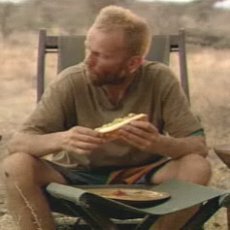 And honestly, this is one of the funniest things that ever could have happened in the first three seasons of Survivor. Frank and Brandon on a movie date? Who would have believed it? 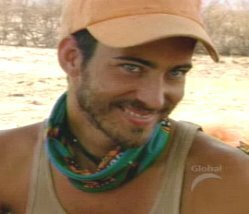 Like I said before, it was a moment that only could have happened on Survivor. This African movie date was funny (and awkward as hell) but like I said, it ended up being was surprisingly sweet too. Because for like 20 minutes in the episode, Frank and Brandon dropped their hatred of one another and actually seemed to co-exist as human beings. It was like the Sean and Paschal scene, but on a whole different level. Frank and Brandon had no business ever hanging out together, but for half an episode they actually looked past their differences and enjoyed a movie together. And it ended up being surprisingly touching. 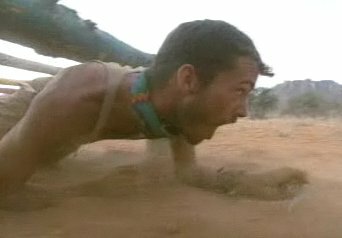 Back in the day, moments like this are what separated Survivor from all the other inferior reality shows. They are what gave the show so much heart. I really wish they would have scenes like this again. Although I'm not so sure they all need to involve Frank.